Hello to you all on this fine spring day! I'm super perky today, which is aided by the fact that I'm wearing a short sleeved top for the first time since September. And it's pink! Life is grand. As I was driving in to work this morning, I was thinking. You know, about STUFF. I do that a lot. ;-) My little mind is always awhirl while I'm driving or walking by myself. Or when I'm in the shower. :0 Anytime my mind is allowed to wander from the task at hand, it will, it seems. At any rate, in the background I had on Fr. 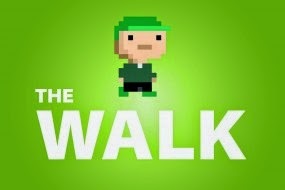 Roderick's The Walk podcast. As you already know, I completely adore that precious Fr. Roderick. I've been listening to his show The Break for, let's see...probably about 6 years now. In that neighborhood of time, at least. When he added in The Walk, I thought maybe it would be duplicated content just targeted at another audience, so perhaps it would be redundant to listen to both. I was wrong, and I happily subscribe to both shows. The Break has a structure: he talks about current events both in his life and in the news, movies and TV shows, books that he's read, and then a segment that he calls "The Peculiar Bunch," in which he'll address a current Catholic topic. The Walk is totally different. It's complete stream of consciousness as he goes out for a walk to get some exercise. He just brings his audio recorder and chats with his audience about whatever is on his mind during that hour. I *really* love this format, and I think that part of it is that I relate to it so much. This is pretty much how I write in this blog. :0 I know that there are blogs out there that are more polished and helpful than mine (AKA: better ;-)). And thank goodness for them, because we all benefit from them! But my approach to blogging has always been that this is an online journal that I choose to share with others. Sometimes I plan posts ahead of time, like the Catholic Book Club or the Church Triumphant posts. But usually, I just await inspiration each morning, and then write about that topic, whatever is on my mind in that moment. And so, this morning I was listening to Father talk about some projects he's working on, and how they're not turning out the way he expected, but that's not necessarily a bad thing, right? God is always working in there. :) And he mentioned how there are so many things he's been able to do that he strove to achieve, but that there are so many others that he'd like to accomplish. As I listened, I related this back to my own life, which is such a pleasing byproduct of this type of informal style. There are LOTS of projects that I've always wanted to try (writing, podcasting...), and yet I often hesitate. I'm worried about...oh, let us count the ways, shall we? (1) Time. I don't want things to take me away from Mike and the kids too much. (2) Money. Some projects require a small investment in new equipment, and then I'll shy away from it, which is silly. I buy yarn, dance costumes and books with abandon, why shouldn't I invest in technology that will bring joy and meaning? (4) Fear of looking stupid. :0 There it is. I really do fear this. A lot. Tomorrow will be a DANCE POST! Make sure to head back over if you enjoy such shenanigans. Hi! New reader here. I just recently started blogging and have been searching out other Catholic bloggers, and I'm so glad I came across your blog! I love love love podcasts! The only one I listen to regularly is a discussion about my favorite TV show, but I think I need to definitely check out the ones you written about here :). I've also in the back of my mind wanted to possibly make a podcast one day, but numbers 3 and 4 on your list are my exact feelings. So thanks for suggesting The Walk podcast - I'm going to check it out asap! Hi Christine! So glad to have you here. Yes, I love Fr. Roderick's podcasts. I also listen to Monday Morning Catholic, The Catholics Next Door and Catholic Weekend. You might like those too!